Introduction: Sidney Hillman, the founder of the Amalgamated Clothing Workers of America (now UNITE!) and its president from 1914 to 1946, invented trade unionism as we know it today. He sought “constructive cooperation” between the union and garment firms to ensure the economic health of the industry and raise the standards of workers within it and pioneered dispute resolution mechanisms that foreshadowed today’s grievance and arbitration procedures. Thanks in large part to his efforts, political action and education became a priority within the labor movement. He also thought the union should serve the interests of its members both on and off the job by providing a wide variety of benefits and community services. And, as a close friend and influential adviser to President Franklin Delano Roosevelt, Hillman was instrumental in shaping landmark labor legislation protecting workers’ rights and living standards. Early Years: Hillman was born in Zagare, Lithuania, part of the greater Russian federation, on March 23, 1887, the son of Schmuel Hillman, a merchant, and Judith Paikin, a shopkeeper. At 14, Hillman left home to attend rabbinical school and soon was caught up in the revolutionary ferment then sweeping Russia. Leaving school after less than a year, Hillman took a job and organized an illegal Jewish trade union. Arrested twice for political activity, Hillman spent several months in Czarist prisons. After the revolutionary uprising of 1905 failed, Hillman fled the country, moving first to Manchester, England, and then in 1907 to Chicago. In Chicago, as an apprentice cutter in a garment factory, Hillman worked long hours under brutal conditions. In 1910, when a dozen women workers walked off the job, sparking a citywide garment strike of 45,000 workers, Hillman, too, put down his tools. Quickly emerging as one of the strike’s leading spokespersons, Hillman convinced his employer, Hart, Schaffner, and Marx, to recognize Local 39 of the United Garment Workers (UGW) and to agree to settle future disputes by arbitration. In recognition of his role in the settlement, Hillman became a business agent for the new local. After the strike, he continued his close association with Jane Addams, Clarence Darrow and other prominent Progressive Era reformers who had supported the garment workers’ struggle and who influenced Hillman’s evolving ideas about industrial democracy and the role of unions. During the 1910 strike, Hillman also met his future wife, Bessie Abramowitz. Abramowitz was an important labor leader in her own right, having been one of the original leaders of the 1910 strike, and she remained active in the labor movement after their marriage in 1916 and the birth of their two daughters. Career as Labor Leader: Inspired by the Chicago strike, immigrant garment workers in other cities organized new local unions. Many affiliated initially with the UGW, but in 1914, dissatisfied with UGW’s leadership, a group of insurgent locals broke away to form their own national organization, the Amalgamated Clothing Workers of America (ACWA). At the founding convention in 1914, the delegates chose Hillman as president. Under Hillman’s leadership, the ACWA established itself as the leading garment union in the country in the men’s clothing industry. During World War I, Hillman lobbied for the creation of a federal Board of Control and Labor Standards for Army Clothing, and under the board’s watchful eye the union flourished. By 1920, the union had contracts with 85 percent of the nation’s garment manufacturers (representing some 177,000 workers), had reduced the workweek to 44 hours and was seeking to reduce it to 40. Hillman’s policy of “constructive cooperation” with employers dated back to the first agreement he negotiated in Chicago. He continued his cooperative policies at the ACWA, even arranging loans and conducting efficiency studies for financially troubled employers. At the same time, Hillman pioneered popular educational and social programs for ACWA’s members, including a low-cost cooperative housing project and unemployment insurance. In the 1920s, Hillman’s “new unionism” was labor’s best-known alternative to the “welfare capitalism” that many large corporations were adopting to enhance productivity and deter unionization. The Great Depression of 1929–1939 strengthened Hillman’s belief in the importance of a strong partnership between government and labor. He was named to the Labor Advisory Board of the National Recovery Administration in 1933 and to the National Industrial Recovery Board in 1934. One of his closest advisers helped Sen. Robert Wagner draft the historic labor legislation that became the National Labor Relations Act. And Hillman himself worked closely with Secretary of Labor Frances Perkins to draft a comprehensive wage and hours bill that eventually became the Fair Labor Standards Act. In the early 1930s, ACWA became one of labor’s fastest-growing unions. Hillman, a supporter of industrial unionism, helped create the new Committee for Industrial Organization in 1935, and he forcefully argued the case for industrial unionism within the American Federation of Labor. In 1937, Hillman pulled ACWA (which had re-affiliated with the AFL in 1933) out of the AFL, joining John L. Lewis and others to found the Congress of Industrial Organizations (CIO). 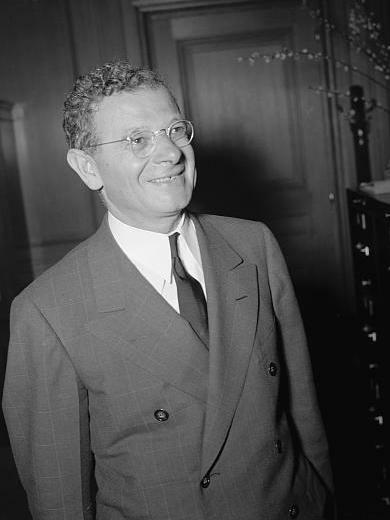 Elected first vice president of the CIO in 1937, Hillman headed up its Textile Workers Organizing Committee and its Department Store Workers Organizing Committee. In 1939, the former gave birth to the Textile Workers Union of America, with more than 100,000 members, while the latter led directly to the creation of the Retail, Wholesale and Department Store Workers Union of America. At the outbreak of war in Europe, many Americans opposed U.S. involvement, but Hillman strongly supported U.S. aid to England and France in their war against Nazi Germany. Roosevelt asked Hillman to serve on the National Defense Advisory Committee in 1940 and named him associate director of the Office of Production Management in 1941. Finally, in 1942, Roosevelt placed the different agencies concerned with war production under the control of the War Production Board and asked Hillman to serve as the head of its labor division. Although many of Hillman’s initiatives during the war never reached fruition, his policies spurred union growth and laid the foundation for postwar prosperity and union influence. Amid trade unionism’s transformation from pariah to partner, many conservatives attacked the very idea of collective bargaining and sought to limit union power. Hillman believed labor’s power rested in large measure on its commitment and ability to activate workers politically. He joined forces with John L. Lewis in 1936 to create Labor’s Non-Partisan League, which mobilized union support for Roosevelt’s re-election on an unprecedented scale across the country in 1936 and again in 1940. In 1942, when conservatives helped Republicans claim sweeping electoral gains, the AFL and the CIO stepped up their political activities. The CIO appointed Hillman chair of its new Political Action Committee (PAC), and under Hillman’s direction, the CIO-PAC mobilized union voters in election districts all across the country in 1944, ensuring Roosevelt a fourth term. By 1944, the CIO had devised a powerful political program and infrastructure—one that has endured, in one form or another, to the present day.